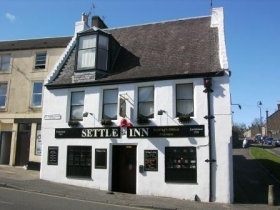 Originally known as the Red Lion, the Settle Inn in St Mary's Wynd opened its doors in 1736 - and boasts the distinction of being Stirling's oldest alehouse. A favourite with soldiers of the Argyll and Sutherland Highlanders during their long residence at Stirling Castle, the Red Lion was also favoured by the invading Jacobite army of Prince Charles Edward Stuart - Bonnie Prince Charlie - whose troops commandeered the tavern during their brief occupation of the town, in January 1746. The log fire and selection of fine ales and whiskies which appeal to modern patrons - a welcoming mix of locals, students and tourists - as they did to the troops. Some traditions are clearly worth preserving.